What the Heck Can We Do About Congress? The following is a letter sent to Representative Joe Heck (R-NV) written by a Henderson, Nevada business owner. Her letter was well stated and addressed the important issues the House has ignored since the midterm elections. She naturally received a form letter in return, not specifically addressing any of these problems. Here is her letter. Is there any chance you can help with these topics? – Filibuster limitations/restrictions or, Congress has to physically stand there and filibuster, not just threaten it countless times. – Campaign finance reform/disclosure – A foreign company can literally infiltrate/buy our election and we wouldn’t know it. – Agree to let the Bush tax cuts expire and then introduce a middle class tax cut that everyone would certainly vote for. – A uniform national voting standard: Everyone should run their elections like Nevada. Our polling stations were efficient and hassle-free and the early voting couldn’t have been easier. Why would we not link up our DMV with voter registration, that way, if you move you still are registered and it’s automatically in the system, instead of having to remind people to re-register. The current system is archaic! Voting rights should be the same, no matter what state you live in. – Please also tell me that you are not for defending “traditional” marriage. We need to be about equal rights and be accepting of who people are, instead of pushing a religious belief onto others. We are a nation founded on secular principles and no one’s freedoms should be limited by a state-sanctioned, religiously motivated laws. – A very radical but a more ethical system would be for insurance companies in every area including health, to be non-profit industries. They should not have the incentive of profit to make decisions that would negatively affect someone’s life. Also, if a religious workplace doesn’t want to allow birth control to be covered due to their beliefs, then as an employer, can I state I don’t believe in immunizations, therefore everyone who works for me cannot get immunizations covered? Both matters are important to people of different religions, so can we cherry pick which services are covered by insurance? When we put it in these terms, it kind of sounds preposterous, doesn’t it? -Lastly, as a “job creator,” I NEVER make hiring decisions based on taxes, the decision is ALWAYS based on demand. Increased demand only comes from a strong middle class. PERIOD. TRICKLE DOWN DOES NOT WORK… NEVER HAS NEVER WILL. This next point was added by Cassandra after the letter was sent, so I thought I’d include it. -Instead of talking about the deficit we should be talking about the fairness deficit and we should be pass a financial speculation tax- 3 trillion over 10 years, repeal capital gains tax break, limit deductions for high earners- people say it can’t all be done on the revenue side?? As Joe Biden would say, MALARKY! 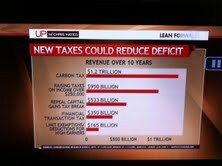 The attached graphic from “Up” with Chris Hayes illustrates ways to accomplish deficit reduction without punishing the poorest citizens among us. These issues are very important to me as a small business owner, mother of four and a community organizer. Thank you for working with others to accomplish legislation that will help regular people, not just the very rich and the big corporations. Thank you for contacting me with your comments regarding the partisan attitude in Washington. I strongly share your concerns and appreciate the opportunity to respond to you on this important issue. I understand the American people are frustrated with the direction of our country and angry about Washington’s out-of-touch responses to the challenges families and businesses are facing. I ran for the House of Representatives so that I could work to change business-as-usual in Washington. Representatives are elected to be accountable to the people and must understand the impacts that their decisions will have upon our country. I’d like to share a few examples of my bipartisan work in Congress. You may be interested to know that I have introduced a number of bills that have received bipartisan support to help create jobs and restore certainty to our economy. In an effort to reduce the cost of energy and promote the use of clean and renewable energy, I introduced H.R. 470, the Hoover Power Allocation Act of 2011, which passed both houses of Congress with strong bipartisan support and has been signed into law (P.L. 112-72). H.R. 470 authorizes the continued allocation of clean, renewable electricity to southern Nevada from the Hoover Dam until 2067. This legislation is essential to the millions of consumers who invested in this renewable source of energy over the past 75 years because it will continue providing them with Hoover power and allow new customers to benefit from this low-cost, clean energy. I am a strong supporter of clean renewable energy, and have supported a number of measures from members on both sides of the aisle to promote renewable energy in Nevada. In order to help create jobs in Nevada, I have introduced H.R. 3039, the Welcoming Business Travelers and Tourists to America Act. My bill has received strong support from members of both parties and will allow for a more efficient tourist and business traveler visa process and address the systemic backlog of applications, all without reducing security protocols. As you know, Nevada’s economy greatly depends on the continuance and expansion of tourism and international travel, and improving the efficiency of America’s visa application process will stimulate job growth in Nevada and generate billions in revenue for our state. We also need to address the housing sector of the economy and help homeowners. In Nevada, almost 400,000 homeowners are currently underwater on their mortgages. Because of this, I believe that homeowners should have both options and resources available to keep them in their homes and avoid foreclosure. That is why I was the only member of my party who voted against H.R. 830, the FHA Refinance Program Termination Act. This bill would eliminate a program that allows for those who are current on their mortgages, but underwater, the ability to refinance. I was also one of only two Republicans who voted against H.R. 839, the HAMP Termination Act, which would have eliminated a program used by many Nevadans affected by the downturn in the housing market. Taking away programs that help homeowners who are trying to do the right thing is not the answer. I will continue to work with my colleagues on both sides of the aisle to give Nevadans the country they deserve. It is my honor to represent Nevadans in the House of Representatives and I will continue to do so with honor and integrity. My responsibility is, and always has been, to the constituents of the 3rd District of Nevada. For additional information, please visit my website, http://www.heck.house.gov. From this site you can access statements about current events or pending legislation, and receive detailed information about the many services that I am privileged to provide for Nevadans. Again, I appreciate your thoughts and it is an honor to serve you in Congress. Your suggestions are always welcome, and if ever I may be of assistance, please do not hesitate to contact me. He presented nothing new or nothing of any practical application, which is unfortunately consistent with the platform of his party’s Presidential candidate (Willard Romney). There is nothing mentioned about eliminating the Bush tax cuts on the wealthy, repairing our health care system or equal rights. These matters don’t seem to concern the Republican party. Maybe if everyone sent their Representative something like this, we would make progress. Feel free to use any part of this post if you wish! Follow Cassandra @CassLibinVegas on Twitter. never been captured at all.